When the first settlers arrived in the Bluegrass region of Kentucky, they found an astonishing landscape of open woodland grazed by vast herds of bison. Farmers quickly replaced the bison with cattle, sheep, and horses, but left many of the trees to shade their pastures. Today, central Kentucky and central Tennessee still boast one of the largest populations of presettlement trees in the nation, found in both rural and urban areas. 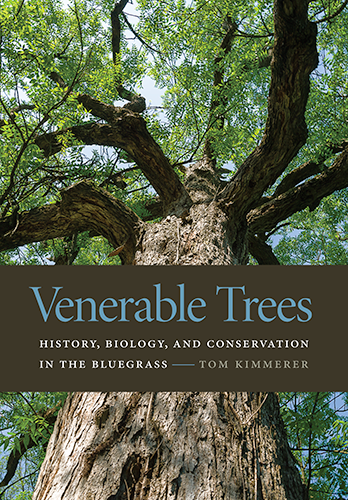 In Venerable Trees: History, Biology, and Conservation in the Bluegrass, Tom Kimmerer showcases the beauty, age, size, and splendor of these ancient trees and the remaining woodland pastures. Documenting the distinctive settlement history that allowed for their preservation, Kimmerer explains the biology of Bluegrass trees and explores the reasons why they are now in danger. He also reveals the dedication and creativity of those fighting to conserve these remarkable three-hundred- to five-hundred-year-old plants—from innovative, conscientious developers who build around them rather than clearing the land to farmers who use lightning rods to protect them from natural disasters. Featuring more than one hundred color photographs, this beautifully illustrated book offers guidelines for conserving ancient trees worldwide while educating readers about their life cycle. Venerable Trees is an informative call to understand the challenges faced by the companions so deeply rooted in the region’s heritage and a passionate plea for their preservation.